My family and I enjoyed a very relaxing time during our stay. Shady Grove was so peaceful and clean. We also enjoyed being able to bring our 2 small dogs. Really close to Cherokee. Thanks for making it a memorable trip. Be back soon. My family and I had a very relaxing vacation in these wonderful mountains. We really enjoyed bringing our fur baby. She enjoyed it too. The cabin was really nice and immaculately clean. We hope to come back soon. Thank you for allowing us the opportunity to stay a few days in your beautiful home. We could sit on the deck for days. Great time with our teenage children enjoying each other and God's awesome creation. Can't wait to come again! Bryson City is our new favorite place for family vacation. It is such an inviting and quiet town. 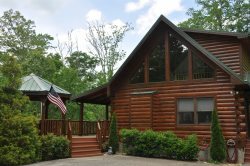 This cabin is the perfect beautiful setting, quiet and peaceful, so much nicer than Gatlinburg. So much to do in the area. It was overall a great visit, we cannot wait to visit again! Thank you! Thank you for a beautiful cabin! We loved the amazing views. The Hot Tub was a big hit with our kids. Great place to enjoy the mountains and make family memories. The stargazing at night was just spectacular along with the mountain views. We went Whitewater rafting, boating on Fontana Lake, Hiking at Wesser Bald, tubing at Deep Creek, attended a play in Bryson City and dinner at Jimmy Macs and Pasqualinos and Ice Cream at the Chocolate shop. Enjoy the scenery and have fun! !